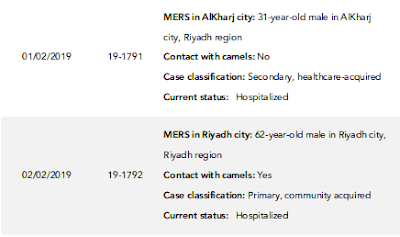 The recent uptick in Saudi MERS cases continues with their 5th & 6th case of Epi Week #5 - one with camel contact from Riyadh, and one from Al Kharj, located about 80 km south of Riyadh - which is reported as a secondary, healthcare-acquired infection. The obvious question, since we haven't any primary cases reported in quite some time from Al Kharj, is the source of this infection. The revised, and far less informative format of reporting adopted by the Saudi MOH last fall also doesn't tell us whether this is a patient or a healthcare worker, or the patient's condition. So far in 2019, the Saudi capital of Riyadh has reported 9 MERS infections; 8 of which had no reported camel contact. With at least 18 cases reported during January (possibly more, since we don't have onset dates for these latest cases), this is the highest number of monthly MERS cases reported globally since August of 2017. Thus far we haven't seen any MOH or WHO updates on Oman's 4 cases reported earlier this week, or on the apparent cluster of community acquired cases reported on Thursday from Wadi Aldwasir in Saudi Arabia. While the number of cases reported remains low - particularly compared to what was reported in 2014 and 2015 - and the locations remain scattered, we do seem to be seeing more clusters being reported over the past 6 weeks. In week 52 of 2018, the Saudi MOH reported on an 80 y.o. female in Sajir City who was hospitalized with MERS and was apparently a secondary household contact of a 45 y.o. male (with camel contact) who was hospitalized in mid-December. Over epi week 1 & 2, the Saudi MOH reported on a 3 person household cluster in Riyadh (see Saudi MOH: Third Case In Riyadh MERS Cluster). In this case, none of these patients reported recent camel contact. In Epi Week 3, the Saudi MOH reported yet another Household Cluster of MERS - this time in Jeddah, again with neither reporting camel contact. In Epi Week 5, the Saudi MOH reported on a 38 y.o. male from Wadi Aldwasir hospitalized with the MERS virus was designated as primary, community acquired with camel contact which was followed two days later by the announcement of 2 Secondary, Community-Acquired MERS Cases in the same city. And while details are scant, earlier this week the Omani MOH announced 4 MERS cases, some of which are likely epidemiologically linked. While none of this is particularly alarming, six clusters in as many weeks is a bit unusual. Hopefully we'll get some more detailed updates on these clusters in the days ahead.